Corny Treats for National Candy Corn Day! 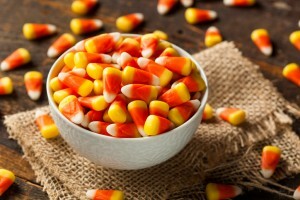 If you love candy corn, why limit that to Halloween! Celebrate National Candy Corn Day with these inventive and fun candy corn recipes! Love the look of candy corn but not the taste? 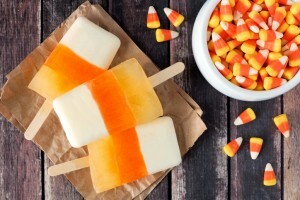 Then these candy corn popsicles will surely hit the spot! Combine the cream of coconut and coconut water in a measuring cup. Pour into 10 3-ounce or 8 4-ounce ice-pop molds, dividing evenly. Freeze until set, at least 2 hours. Mix the mango juice with 1 drop of red food coloring in a measuring cup. Pour on top of the coconut mixture, dividing evenly. Insert the ice-pop sticks, pushing gently into the coconut mixture. Freeze until firm, at least 2 hours. Pour the pineapple juice on top of the mango, dividing evenly. Freeze until firm, at least 2 hours and up to 4 days. Whoever said candy corn was strictly a Halloween candy was completely wrong. 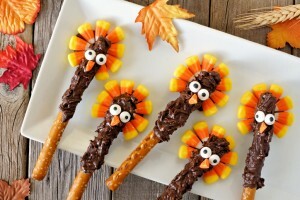 Tis the season with this colorful candy and make the perfect turkeys on a pretzel stick! Lay cookies out on wax paper leaving room for pretzel rods to lay on top of each cookie without touching each other. Using a spoon drizzle a little chocolate around on cookie to glue candy corn in place. Heat Chocolate Chips in tall glass or cup by microwaving for 30 seconds stirring and repeating until melted. Allow to cool for 2-3 minutes. Dip pretzel 2/3 way in melted chocolate and roll to coat completely. Shake off excess. Lay on wax paper on top of cookie as shown in picture. Place candy corn in fan shape on cookie around pretzel rod. Place in refrigerator for 10 minutes to set candy mix. Using a spoon place a little chocolate to “glue in place eyes and Reese’s Piece on end for beak. Clip corner of bag and pipe a waddle under the beak of each turkey. Everyone loves homemade cupcakes! Want to make it even more exciting? Layer it like a candy corn! Your family is sure to love these sweet little treats. Preheat oven to 350 degrees and line cupcake pan with paper liners. Combine all ingredients in a large bowl until incorporated. Scrape sides of bowl and then beat on medium-high speed for 3 minutes. Divide batter in half and color one half orange and the other half yellow. Wilton has color gels that are vivid. You can find them at craft stores. Fill paper liners with about 1-2 Tablespoons of yellow batter. Then top with 1-2 Tablespoons of orange batter. Bake per cake mix package directions – about 15-18 minutes. 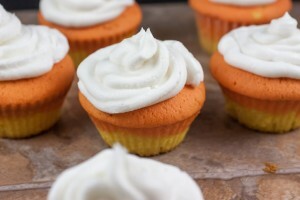 Cool cupcakes and frost with your favorite frosting and garnish with a candy corn and sprinkles. Makes 18 cupcakes. For the Buttercream frosting: In a mixing bowl, cream butter until fluffy. Add sugar and continue creaming until well blended. Add salt, vanilla, and whipping cream. Blend on low speed until moistened. Beat at high speed until frosting is fluffy.